The 5-Day Beginning Auto Window Tinting Training Course is our most popular hands-on automotive window tinting training school and is now only $1200! This tuition fee is for a limited time only AND can ultimately be FREE (see details below). The 5-Day Beginning Auto Window Tinting Training Course "starts" on the 1st & 3rd Monday of every month with a maximum of only 4 students per week and is scheduled from 8 am to 5 pm every day. NOTE: all course Start Dates are subject to change unless otherwise noted. The 3-Day Intermediate Auto Window Tinting Training Course is only $1000 and designed to be taken only if you understand the basics of window tinting, or have tinted at least 100 vehicles (see details below). NOTE: This course is already included in the 5-Day Auto Window Tinting Training Course! The 1-Day Advanced Auto Window Tinting Training Course is only $500 and designed to be taken only by those who have tinted auto windows professionally, or have experience tinting at least 500 vehicles (see details below). NOTE: This course is already included in the 5-Day Auto Window Tinting Course! Keep in mind: Please don't be fooled by any "so-called" window tinting training schools that do not offer the valuable curriculum time you need AND have the window tinting experience we do! But don't take our word for it... click HERE to see what our graduates had to say about us when it came to making the best choice for their window tinting training school needs...just as you are doing right now! Please see details below, or if you're ready now to get your automotive window tinting training school started, then please go directly to the Registration Page. Below is a small example of some of the areas and techniques you will be taught here at Windowtinting.com School of the Trade, with a glimpse into our "Secret Tips" which will be the most important lessons to be learned at our automotive window tinting training school. Our Question and Answer section (see link below) accompanies it as well as our money back guarantee... Yes, money back guarantee!!! All of this is followed by our tuition fees for the automotive window tinting training; which can ultimately become FREE, YES FREE...see details below on this page. Cost Avg. : Install = $200, Materials = $40, Time = 2hr., Profit = $80 per hr! Proper Chemicals & Mounting Solutions: The Automotive "Secret Sauce"
Prepping Techniques: Cutting & Squeeging 101 and The Automotive "Process"
Tinting Laws Clarification: Who Is The I.W.F.A.? Back Glass Installs: "One Piece" techniques by yourself…yes, by yourself! Sources on Purchasing: Film & Supplies...Dealership Level Buying Power! Film Removal: Roll-ups & Back Glass with The Secret Amazing Results! Graduation Ceremony: Certifications, Pictures, and Q&A "FUN" Prizes Drawing! Complete window tinting course including Intermediate and Advanced level training. This course should be taken if you have no knowledge of tinting professionally. 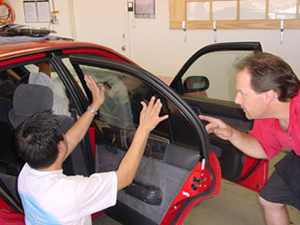 You will be taught everything from how to prep a window, to how to install a one-piece back glass tint -- by yourself! -- with our proven techniques and near flawless results. 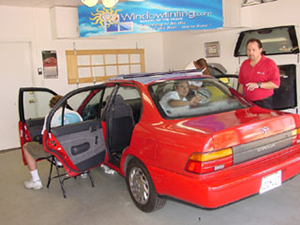 This window tinting course includes Advanced level training. This course should be taken only if you understand the basics of window tinting (or have tinted at least 100 vehicles). Learn how to achieve near flawless installation in half the time it may take others -- an important asset in this most competitive field. This window tinting course should be taken only by those who have tinted professionally (at least 500 vehicles), and/or those who feel that they're almost near flawless, but would like to take their tinting skills to the next and final level, and be near flawless. Wait There's More... FREE Window Tinting Training Course Fees Program!!! If you have not already read about it, the best part about our training course(s) is all of your tuition fees can ultimately become FREE! …yes, please let us explain. After your graduation, you will obviously need to purchase film in order to perform your installations, and of course you are welcome to choose any supplier you wish and are under no obligation from us. However, if you choose to purchase film from our recommend supplier/sponsor, then in addition to receiving our negotiated lowest "dealership level" pricing on your behalf, they have also agreed to grant you (my students only) an additional 10% savings up until that total savings amount has equaled your cost of the window tinting course(s) itself. At that time, the 10% discount program will be discontinued; however, you will still receive the dealership level pricing for window film ongoing... it's that simple! So you see, ultimately all of your window tinting training fees can become FREE! Please contact us for the complete details on how to become a dealer TODAY! Plus "Dealership level" film buying power!! !...just ask us how? WOW!!! A savings of over $650.00!! !...That's over 1/2 the course itself!!! *The "hotel to the school and back" transportation is only available for student's that are physically unable to rent a vehicle (i.e., age restrictions, license suspended/revoked, etc.). Please contact us for all the details.